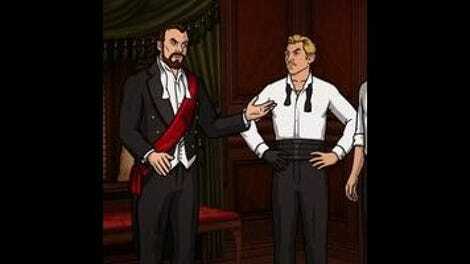 I’ve said it before, but it bears repeating: Archer has one of the best voice casts on television. Between H. Jon Benjamin’s boundless confidence, Aisha Tyler’s self-aware mixture of weariness and indignation, and the lunacy that Amber Nash, Lucky Yates, and Judy Greer all inject into their roles, there is no group of performers I can think of that’s better suited to bouncing this show’s quick-fire, literate, ludicrous dialogue off of each other. Which, I think, helps explain why “Bel Panto: Part II” felt like such a let-down for me. Because between the evil clowns, Veronica Deane, Ellis Crane, and all the cops running around outside, it felt like precious little of this episode involved The Figgis Agency dropping weird references and put-downs on each other’s heads, which is usually where Archer shines. What was there was as good as ever—and I could never truly hate an episode in which Pam Poovey goes all Die Hard on an evil clown making himself a giant, Scooby-Doo-esque sandwich—but it’s still a marked dip in quality from the two-parter’s excellent first installment. 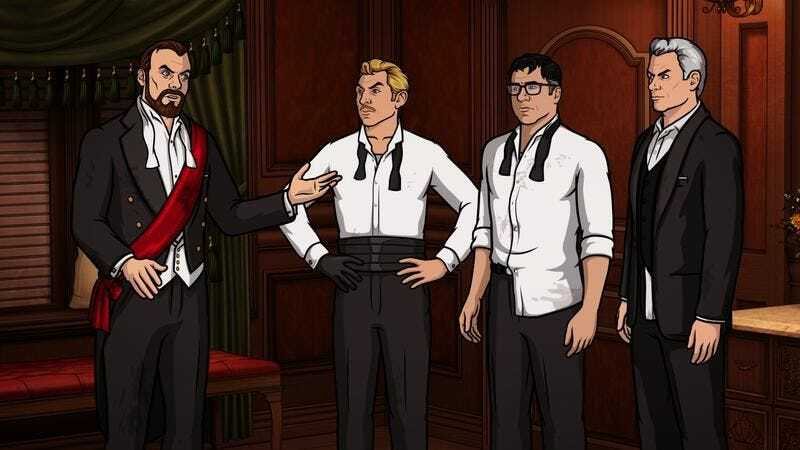 Okay, so when last we left the “core group,” Archer had just finished disguising himself as (the late) Pinky Brewster, one of the gun-toting clowns that were holding his friends, boss, and mother hostage. This week, he’s skulking around the irritatingly giant mansion of movie producer Ellis Crane, as two probably-not-actually cops, Dietrich and Harris (Keegan-Michael Key and J.K. Simmons, returning from the season premiere) ineptly try to talk down Mr. Rompers and his potentially murderous crew. From there, things quickly devolve into the rare “hostage farce,” with Pam and Lana both also disguising themselves as robbers, and Cheryl descending even further into Stockholm Syndrome and hilariously snotty references to the Bechdel Test. Also not working for me: any of the scenes taking place outside the house. Key and Simmons are both very funny actors, but there’s something about their performances—overly mannered in Simmons’ case, and puppy-dog enthused for Key—that didn’t mesh with Archer’s normal comedic tone. The gag about Dietrich’s belief in magical “knock-out” gas is pretty funny, but the duo is mostly just there to offer up exposition, in an episode that’s already way too heavy with it. So, what does work? Well, there’s the aforementioned Pam plot, because any time Pam gets to lob one-liners and beat the crap out of people, I’m on board. That leads into this week’s (co-)entry in this season’s ongoing effort to do something visually impressive in every single episode, a knock-down, drag-out fight between a still-disguised Lana, Archer, and Pam in the mansion’s gym. Between the improvised weapon use, three-way combat, and Pam going full-Zangief and suplexing Lana, it might be the best bit of hand-to-hand warfare the show’s ever offered up. It also leads into a strong moment when Pam—who shares episode MVP status, as usual, with a sparsely used but brilliant Cheryl—telling both of her co-workers to knock off their romantic bickering and get back to work. That leads into the climax of the hostage plot, which also works, if only in how audaciously it throws away everything that came before. After all the rigmarole to get half the cast into clown disguises, there’s something very funny about them arriving just in time to see the rest of the crew (and the orchestra) also dressed up as clowns, as part of the robber’s escape plot. Cue the cops and their beanbag cannons, for a beautifully executed slow-motion takedown that’s full of lovely character moments—Shapiro throwing himself in front of Veronica, Archer laughing at him taking a beanbag to the junk, Lana looking on worriedly when Archer gets hit—and one of the funniest punchlines the show’s deployed all year. It ends—as almost every episode this season has: with someone asking, “What have we learned?” and getting an elaborate shrug as a reply. Which is fine; this is a show about people goofing off and annoying each other, not spending a lot of time learning and growing. Let’s just hope it gets back to more of what it’s best at when it comes back again next week. It’s official: I’m anti-bumper. They’re stylish, but the one at the end of the third act kills the timing on Cheryl’s amazing final line. I kept expecting Mr. Rompers—who’s another element that I think is too mired in plot stuff to really work—to be revealed as a failed actor, given the theatricality of all his lines. Dietrich and Harris: CIA? KGB? Actors, researching a role? Because they really don’t seem like cops. “Enema! Just talkin’ ’bout enemas. And, uh, how clean and fresh they make ya feel. I mean, not you, per se, but people, you know, in general, I guess? And kids, also, maybe, I don’t know what kids are into these days. Are whippets still a thing? Point is… Shitter’s clogged!” Amber Nash, ladies and gentlemen. “Oh, what, did I walk into the Titanic?” The running jokes about Crane’s labyrinth of a mansion are consistently fun. I’m not sure which sight-gag I loved more: Cheryl slowly putting on her clown makeup, or the reveal of the orchestra wearing it at the end. Line of the episode: Weird bumper timing or no, I’ve watched Cheryl idly muse “This was my… third best birthday” in slow-motion five times now and still laugh every damn time.